The National Heavy Vehicle Regulator (NHVR) has unveiled a new heavy vehicle classification chart based on the Heavy Vehicle National Law (HVNL) specifications. The Classes of Heavy Vehicle chart aims to help operators match common heavy vehicles with the three categories used under the law. 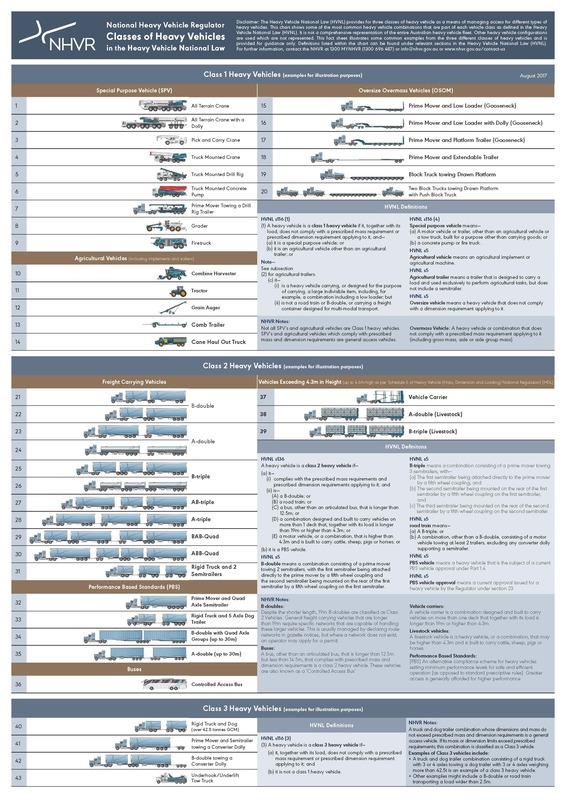 NHVR access manager Roger Garcia says the chart illustrates some of the most common heavy vehicle combinations that are part of each vehicle class as defined in the HVNL. "While the NHVR and operators use common terms such as B-doubles, low loaders or mobile cranes for Restricted Access Vehicles, they are classified into classes under the HVNL," Garcia says. "For example, pick and carry cranes commonly fall under the Class 1 heavy vehicle category, and this can be easily determined from our new easy-to-read chart." The chart lists other common examples from the three different classes of heavy vehicles, such as oversize and overmass vehicles, special purpose vehicles, agricultural vehicles and vehicles under the Performance Based Standards (PBS) scheme. NHVR notes that the chart is not a comprehensive representation of the entire Australian heavy vehicle fleet. A comprehensive description of heavy vehicle classes is provided in section 116 of the HVNL for class 1 and 3 heavy vehicles and section 136 of the HVNL for class 2 heavy vehicles. "The chart will also support the NHVR’s National Harmonisation Program which is working with the heavy vehicle industry on four new national notices for B-doubles, road trains, higher mass limits and agricultural vehicles and combinations," Garcia says. "It will provide industry with a clear understanding of what class their heavy vehicle belongs to when applying for an access permit, or when operating under a notice. "This chart illustrates some common examples from the three different classes of heavy vehicles and is provided for guidance only."